Montreal will build a new amphitheatre on Parc Jean-Drapeau to increase festival-space capacity from 45,000 to 65,000, but it won't be done in time for the city’s 375th anniversary, as planned. Montreal will redevelop its festival space on Parc Jean-Drapeau to increase capacity from 45,000 to 65,000, but it won't be done in time for the city's 375th-anniversary celebrations, as planned. The goal of the project is to attract more mega-shows to the park. Osheaga, Heavy MTL and IleSoniq are the only festivals that now book that space. Occasional one-off shows, such as Arcade Fire's homecoming concert in 2013, have also used the site. 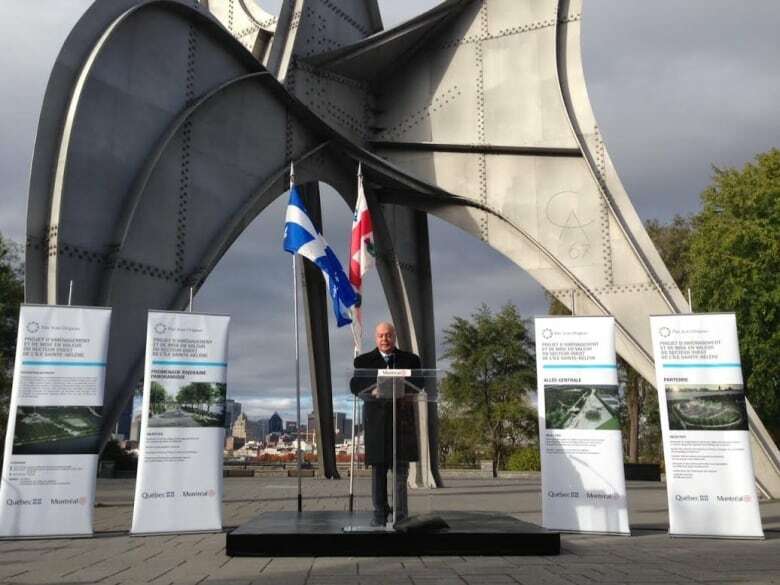 "This project aims to revive a unique location and fulfill our commitment to reposition Jean-Drapeau Park as a tourist destination of international calibre," Henkel said. 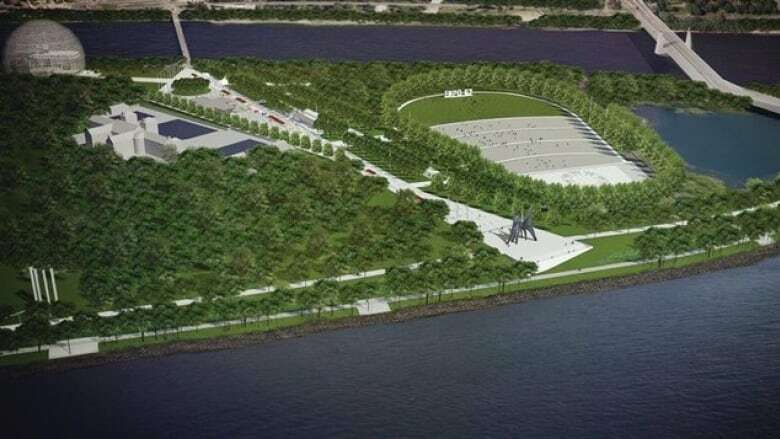 The project is likely to renew tensions between the City of Montreal and its South Shore neighbours: The main stage of the amphitheatre will face Saint-Lambert across the river. Saint-Lambert's residents have complained about concert noise in the past, and the city lost a legal fight last summer to force concert promoter Evenko and the City of Montreal to turn down the volume at summer music events. "I hope the city of Montreal will implement the many recommendations we gave them in order to reduce the sound," Saint-Lambert Mayor Alain Dépatie said Friday. "We don't want the show to stop. It's an economic boost for the area. But we would like some peace and quiet on Saturday and Sunday night." The potential for more conflict doesn't seem to faze Coderre, who said the redevelopment will address the noise concern. "We invested $2 million in this project precisely to ensure that there are mitigation measures for the noise level," Coderre said. He said sound tests have been carried out, and the levels conform to noise regulations. Asked what he would say to Dépatie if noise remains a nuisance, Coderre responded, "All I really have to say to him is, 'Have a nice day.'" Although it was originally planned for Montreal's 375th anniversary in 2017, irregularities in contracts forced the city to postpone the project, which won't be completed until 2019. The cost of the two-year project is to be evenly split between the City of Montreal and Quebec City. Henkel says the SPJD is working with sponsors and event organizers to find alternative sites for Osheaga and other festivals during the project's construction period. In an interview with Radio-Canada, city opposition leader Luc Ferrandez said he doesn't favour the amphitheatre project, which he said mostly serves to lower the costs to event organizers like Evenko. "At first glance, I do not see the point of the project...I think we should question the expansion of these events and leave the costs of holding these festivals to the organizers," Ferrandez said.